Being on Rachel Harris’ Flirt Squad, I was eagerly awaiting the release of her book. 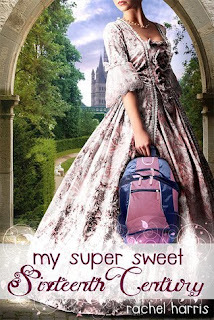 Promoting “My Super Sweet Sixteenth Century” has been such a blast, I was excited to receive my pre-ordered copy early from Amazon. Finally I am getting a chance to review this lovely book for my lovely author friend Rachel Harris. I have to say that time traveling has never been my favorite “subject” to read, mainly because it isn’t something that we have accomplished yet in life and I will be amazed if we actually do. However, I do think that it is a nice thought. I started watching Doctor Who and then I read So Close to You by Rachel Carter that I thought that maybe I haven’t give the time traveling “subject/genre” a chance. Along came Rachel Harris and her lovely Flirt Squad invitation. Of course I jumped on the chance, I mean come on who wouldn’t want to be a part of something called the Flirt Squad? Not only did I participate in the Flirt Squad but I got my sister to join and a friend of mine. It is a blast. We have fun and discuss contests and things going on. Now I know this is supposed to be a review for the book and it will be but the Flirt Squad was my first introduction to Rachel’s book. Rachel kept the pace moving which I appreciated a lot because honestly I was a little afraid that the book was going to be more teeny bopper than anything else. Rachel portrays such beautiful characters; I like how she develops each personality and how perfect they fit together. You have Cat Crawford the American girl, Alessandra the Renaissance’s girl, Lorenzo the swoon worthy boy from the Renaissance’s, Cipriano the protective big brother, and Niccolo the slightly creepy “bad” guy. Cat Crawford is not your typical Hollywood girl. She is the daughter of two Hollywood icons, who are divorced, and her father has plans to marry Jenna. Cat is a very relatable character, she is in that stage where she is trying to figure out who she is. She doesn’t want to let anyone close to her because of what her mom did yet all Cat really wants is to be loved. 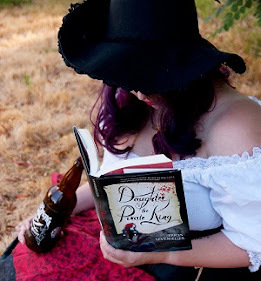 I like real characters and Cat was real to me, I was sympathetic towards her, cheering her on, sitting on the edge of my seat reading on to find out what happens next. I was very thankful that Rachel wrote a down to earth character, she left out the spoiled brat and gave us a geek. Can I just say that I prefer geeks over brats? Honestly I do. I would rather read about a geek any day then a spoiled brat. Lorenzo Cappelli, where to start…he is sweet, attractive, an artist, smart, and did I mention attractive? Lorenzo is a major part of My Super Sweet Sixteenth Century. He influenced Cat a lot with her thinking and of courses the decisions she started making. He showed Cat that she can open up and feel loved. This is a perfect romantic book for teens. It wasn’t cheesy or over done. I would probably give this book to anyone over the age of 12 and up to read. I think many ages would enjoy this book not to mention who wouldn’t love to read about a guy like Lorenzo. I absolutely loved this book. Cat is amazing. She may not have fit in during the Sixteenth Century but she tried her best to make it a better place for her cousins. Less and Cip; I loved these two. Cip is the big brother that I never had. I’m the oldest so no big brothers for me. Cip makes sure that his sister and cousin “Patience” is taken care of and safe. He is also a good friend of Lorenzo’s. Less is the sister and best friend all rolled into one. Less has dreams of becoming an actress, she wants to perform and unfortunately she is in the wrong century to do so. Cat gives her lessons and pointers on it anyway just so they could have fun by playing a little game. Cat is on a trip to Italy when something out of the ordinary happens to her and she finds herself walking into the sixteenth century. Cat assumes that there is a lesson for her to learn before she is able to go home. Cat ends up on the doorstep of her some very distance relatives and she has to live under the name of “Patience”. Since this is the sixteenth century and not present day, Cat doesn’t have to worry about the paparazzi and she is finally given a chance to make friends and to learn how to love people and let them in. Cat gets a chance to just be herself. Eventually Cat ends up back in her own time stream but what happens at the end made my jaw drop. I do have to say I had an idea about how it was going to go and it did lean in that direction but I was wrong slightly wrong. I have my theories. If anyone is interested about knowing my theories or if you want to know what I thought was going to happen in the end, let me know because I will tell you. Rachel, my friend, you deserve plenty of praise. This was an amazing book and I think you did a wonderful job with it. I am going to be impatiently waiting for book 2 because I am dying to know what will happen next. If you don’t own a copy yet, I recommend that you buy one or try to borrow a copy from a friend or library. I liked the book so much I bought a copy for a friend. I can’t wait to hear how she likes it.